Hockey fans are filled with the excitement as they attend a fan-fair in preparation for the NHL All-Star Game in San Jose. Fans were able to take pictures with the Stanley Cup and meet fans from rival teams. Christie Smith reports. Hockey fans in the South Bay are excited for the start of the NHL All-Star game. Eager fans came out to the McEnery Convention Center Saturday in Downtown San Jose for the NHL Fan Fair to prepare for the for the big game. 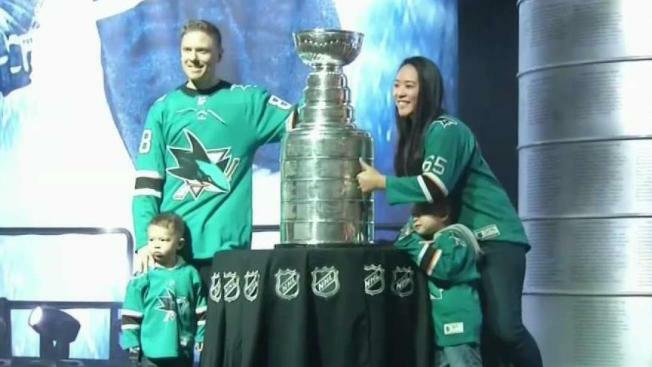 "I think the Stanley cup is the most important thing so they got to see that memory and have their picture with them as well," Mark Gentrup from San Jose said. Sharks fans were able to interact with rival fans from other NHL teams and even got to see mascots participate in a competition. Fans also had the opportunity to take a picture with the Stanley Cup. "It’s pretty good to see them mingling with the people it’s pretty cool," said John Gibson, goalie for the Anaheim Ducks. The last day for fans to attend the fan fair is Sunday.